Holy Trinity Church in McAdoo, PA is located about 4 miles south of Hazelton, on Route 309. Route 309 goes right through McAdoo and becomes the central main street, Kennedy Dr.
Take Route 22 to 309 north, and follow 309 north into McAdoo. Take I-81 south to the McAdoo/Route 309 exit. Take I-81 north to the McAdoo/Route 39 exit. Take I-80 west to I-81 south. Take I-81 south past Hazleton and take the McAdoo/Route 309 exit. Take I-80 east to I-81 south. Take I-81 south past Hazleton and take the McAdoo/Route 309 exit. Holy Trinity Russian Orthodox Greek Catholic Church of McAdoo was establised at the turn of the twentieth century, when thousands of immigrants from Russia, Poland and Austria began to settle in Pennsylvania’s anthracite coal region. Those men who found work near McAdoo soon bound themselves into a beneficial society in the name of the “Holy Virgin Protectorate”, a chapter of the national Russian Orthodox Catholic Mutual Aid Society in America. The early founders and their founders at first attended church services of various denominations, but soon exhibited a strong preference for the dogmas, teachings, customs and rites of the Orthodox Church. Not excluding the two Orthodox Churches in nearby Freeland, Holy Trinity Church in McAdoo became the only Orthodox Church in the vicinity of Greater Hazelton. Metropolitan Platon of the Russian Orthodox Church in North America fulfilled the wishes of these Orthodox believers by assigneing Fr Alexander Nemolovsky the task of establishing the new parish, and he together with his flock lost no time in procuring a modest frame church, formerly a Protestant Lutheran church from the neighboring town of Kelayres. The building was moved to its new location of South Tamaqua St in McAdoo by a large mule team furnished by the Lehigh and Wilkes-Barre Coal Co. Shortly thereafter, these men also constructed a belfry next to the church edifice. A prized possession of the first church was an exact duplicate of the renowned icon of the Theotokos entitled Our Lady of Kazan, a gift of the first pastor and founder Fr Nemolovsky. This icon is in the church to this day. Fr Alexander’s pastorate was to be short. Eight years later he was elected to the office of Bishop of Alaska, in which rank he blessed Holy Trinity’s new rectory on May 30, 1913. Later, as Metropolitan Alexander, he was primate of the Russian Orthodox Church of North America. He died in Belgium in 1960. 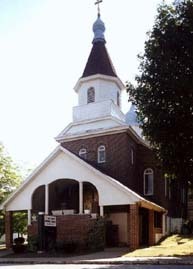 At the annual parish meeting on January 17, 1916, the members resolved to replace the frame church with a new brick structure. The plans for this first building in McAdoo to be built with structural steel were drawn up by a New York architect, John Bergenson; a local contractor, Hugh L Campbell, did the construction. In May 1926, Metropolitan Platon blessed the church interior, newly decorated with stenciling, frescoes, and icons. Serving with him were pastor Fr Peter Semashko and area clergy. In 1951, during the pastorate of Fr Michael Karas, Holy Trinity celebrated its golden jubilee. His Grace, Bishop Nikon celebrated the Divine Liturgy. New murals and icons painted by Michael Kupetz and Sofronios Afentakis were blessed. A choir from St Mary’s in Coaldale was directed by Seminarian Daniel Ressetar, who later became pastor at Holy Trinity. From 1952-1958, a time of scarcity of available clergy, priests who were displaced persons from Europe were assigned to Holy Trinity. Their missionary zeal for Orthodoxy was very pronounced. One of them, VRev John Bekish, was later elevated to the rank of bishop, and later, as Metropolitan Iriney, held the rank of Primate of the Orthodox Church in America. In 1961, during the pastorate of Fr Daniel Ressetar, Archbishop Dmitry of Philadelphia consecrated a new Holy Table, designed and made by Mr Ignatz Mandrick, a parishioner who also built all of the white tables in the church. During the pastorate of Fr Joseph Martin (1965-1995), the inside of the rectory was extensively remodeled in 1966 and a new Iconostas was installed. The icons were donated by parishioners and painted by Mr Serge Bodasiuk of New York City. In 2000, the marbleized portion of the walls were repaired and repainted by Michael Kurtz, Sr. In 2001, in preparation for the Centennial celebration, roof work was carried out and the interior of the church walls were repaired and repainted. On July 8, 2001 the parish celebrated its cenetennial anniversary. Archbishop Herman of Philadelphia celebrated the Divine Liturgy. He was assisted by Frs Claude Vinyard (temporary priest-in-charge) Joseph Martin and Theodore Orzolek (former pastors) as well as other priests from local parishes in the deanery. The responses were sung by Holy Trinity choir, joined by several singers from Holy Resurrection Cathedral, Wilkes-Barre, under the direction of David Kessler, choir director of Holy Resurrection. At the end of the Liturgy, a Synodal Gramota was presented to the parish. A banquet followed at a local restaurant. Over the years, many spiritual projects and beautifications of the temple have been carried out, as the parish grew and prospered by God’s grace and under the guidance of many priests and bishops. Our Holy Trinity parish is proud that two of its pastors have become bishops and primates of our church: its founder Fr Alexander Nemolovsky and Fr John Bekish (later Metropolitan Ireney). Bishop Innocent of Hagerstown, MD was also a former parishioner of Holy Trinity. Many people have been involved with the life of Holy Trinity Church during its first 100 years. Many, both known and unknown, have given of their time and efforts to improve the Church life. May the Holy Trinity bless each and every one of these people; may those who have gone on to their final reward have heavenly peace and may their memory be eternal. To those who remain may Almighty God give us the strength and the courage to carry on the work which had begun over a century ago. With the establishment of the autocephalous Orthodox Church in America in 1970, the mission of Orthodoxy has taken a new course. May the Holy Spirit ever guide us in the way we must follow.